Squash season is here! This recipe is faster and easier than the prep and cooking times suggest. Most of the hands-on work is done while the squash is cooking. 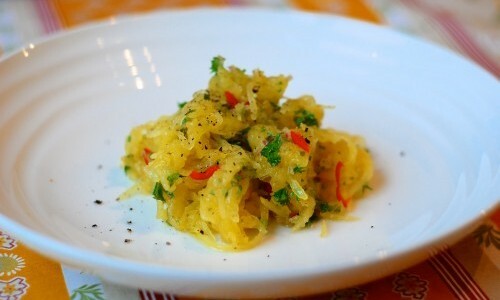 When the squash comes out of the oven (or microwave), there’s nothing left to do but scrape out the strandy insides and toss them with the citrus-chile vinaigrette. You can serve this as a side, or you can beef it up to main course heartiness by adding slices of sausage, chunks of feta or cooked chickpeas. Microwave method: Prick the squash (to a few centimetres deep) all over with a sharp knife. Zap in on high power for 6 to 7 minutes, turn the squash over and zap another 8 to 10 minutes, until the squash is slightly soft when pressed. Cool for at least 5 minutes before cutting it open. Oven method: The easiest way to do this is to prick the squash all over (to a few centimetres deep) with a sharp knife and bake it in a 175C/375F oven for one hour. If you are handy with large knives, cut the squash in half, scoop out the seeds and lightly oil the exposed surfaces. Since you’ve got the thing open already, you might as well season with a little salt and pepper. Roast the halves face down in an oiled pan in a 175C/375F oven for 40 minutes. Halved or intact, the squash should be slightly soft when pressed. 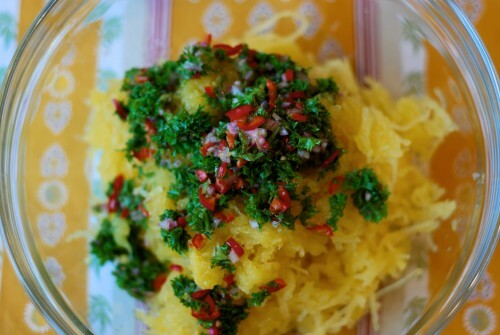 While the squash is cooking, whisk together the lemon juice, zest, shallot, chile, salt and sugar and let sit for 5 minutes. 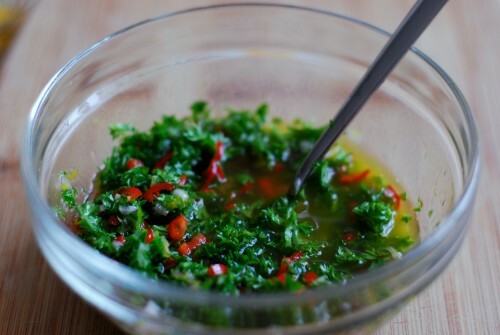 Whisk in the olive oil, vinegar and about half the chopped parsley or cilantro. 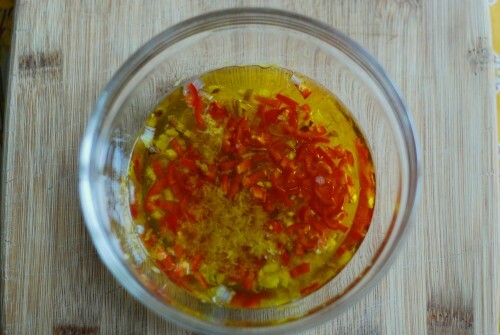 The vinaigrette will be quite sharp, but the sweetness of the squash should balance it out well. 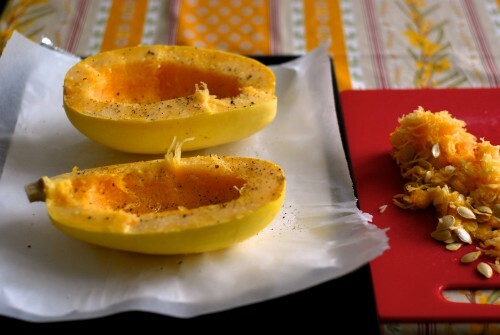 If you cooked the squash whole, cut it open, being careful of the steam, and remove the seeds. If you halved the squash before roasting, you’re all set. 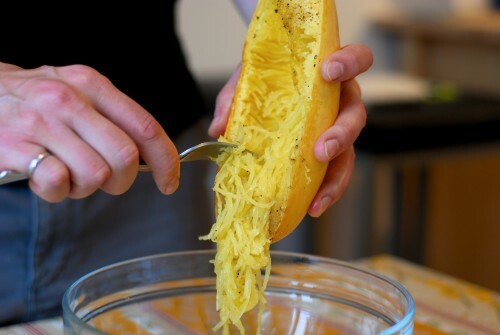 Using a fork, gently loosen and scrape the squash strands into a large bowl. Toss with the vinaigrette and the rest of the chopped greenery. 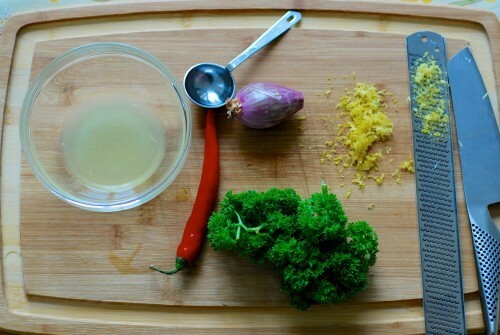 This entry was posted in recipe, veg. Bookmark the permalink.